A novelty at Ste. Marie 2016. Drusy growth, on matrix, of crystals with a very short, almost non-existent prism. 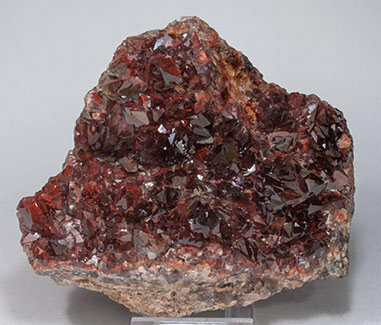 They are extraordinarily bright and have an unusually intense and deep red color due to very fine Hematite inclusions. Among the best known, for the color, of this Quartz variety.